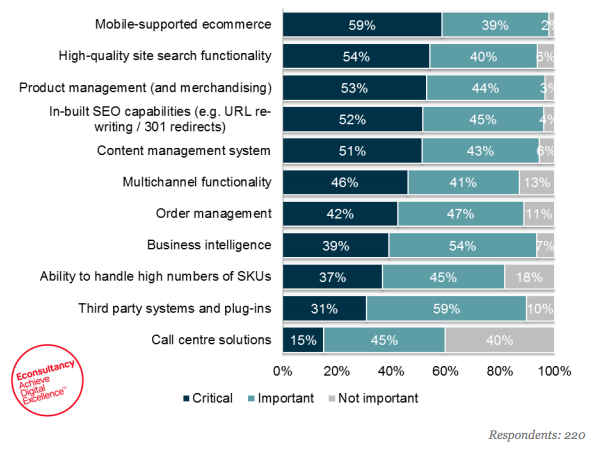 A latest report from Econsultancy from a survey of 600 clients identifies the most important functions of ecommerce solutions. As an ecommerce company, does this list fairly represent the most important functions? How about which areas are served well and which areas still have problems and challenges? For example, is mobile support a strong solution in your ecommerce solution? Are you satisfied with the search functionality? Which technology platform provides the best solution for critical functionality in ecommerce? This entry was posted in General by Hemant Khandelwal. Bookmark the permalink. Harness – We are on a Mission! Making an impact with technology, building new India! naveen on The future of transport is closer than you think! naveen on How Rivigo is contributing to the future of internet!